After the excellent The Revenant King three years ago, Visigoth's sophomore release emerges with another helping of their trademark sound, a sound as heavy and inexorable as the vengeful warriors evoked by its lyrics. Conqueror's Oath doesn't change things up much from their debut, but then, given their revitalized version of old-time US heavy metal, most of their listeners wouldn't want them to. Like The Revenant King, Conqueror's Oath is unpretentious US heavy metal, unsullied by either cheesy retro-worship or power-metal sugar. This time, the band opted to make the songs shorter and more focused, with none of the instrumental wandering of three years ago, and that works to their advantage, as the full weight of the band's attack is more noticable now that it is packed into a smaller space. You might not end up humming the songs' melodies in the shower, but all of them are custom-made for heavy metal warriors to sing along with the band in the mosh pit. Warrior Queen, a galloping NWOBHM-style piece with an especially memorable verse riff, shows off vocalist Jake Rogers' magnificant baritone vocals to their best advantage, and it also shows that Visigoth can add more variety to their sword-and-sorcery-drenched tracks than they used to. The Riot-style Blades in the Night is also exceptionally well made, a speed-metal tune that gives the band's heavy riffing a dose of high-octane gasoline. It's hard for a heavy metal band to go wrong with a speed setting like that, though we still see an occasional tendency to wander off the beaten track in a way that Thundersteel never did, which reduces the overall impact. The intro of Traitor's Gate is another example of this variety. Rogers starts with an clean vocal solo, then launches in on top of a furious storm of riffing by the guitars to castigate the eponymous traitor before the final verse when his alter ego finally kills him. Right after that, however, is the lighter side of the band, in the form of an ode to their hometown of Salt Lake City, a sincerely-meant shout-out that paints a picture of the City of the Saints in heroic colors. 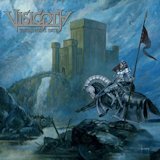 And heroism, after all, is what the Visigoth epic metal sound is all about, from the old-time overdrive guitar distortion to Rogers' gritty but clean vocal treatment. Listening to it, we -- their listeners -- temporarily visit a world whose soundtrack is a crushing set of twin-guitar riffs. On Conqueror's Oath, that soundtrack shows no signs of stopping any time soon.